A credit score of 569 indicates that you’ve got some work ahead. Nothing’s impossible, but it’s also not easy. At this level, the best thing you can do is focus on raising that number. If you’re going to apply for loans, make sure the monthly payments are reasonable. Check the interest rate too, as those can become astronomical at your score. Pay your bills on time and avoid getting in over your head with credit lines. With that pattern, you’ll be able to raise your score by 100 points or more. However, you’ve got to start somewhere. By the end of this article, you’ll know exactly where. Most credit card companies won’t take the risk on you with a credit score of 569. It’s unfortunate, but you must stay realistic about this. That’s why you start with a secured credit card. Once you start making steady payments, it establishes a good record. Over time, you build a reputation and become trustworthy in the eyes of creditors. Then you can graduate to a “real” credit card. Don’t go crazy, though! Always balance your credit to debt ratio reasonably. If you don’t have the money to pay for it straight out, don’t put it on your card. If not, you’ll be back at square one in no time! Auto loans are a little easier. Just about anyone can qualify if you go to the right place. Unfortunately, it’s hard to find a reputable or reasonable creditor. Be careful because you may find yourself falling prey to a bad financial situation. Low/no credit auto loans will lock you into interest rates as high as the principle. If you are desperate for a car, it really does put you into a bind. However, just a few months of credit building can put you in a better spot to qualify from a legitimate financer. 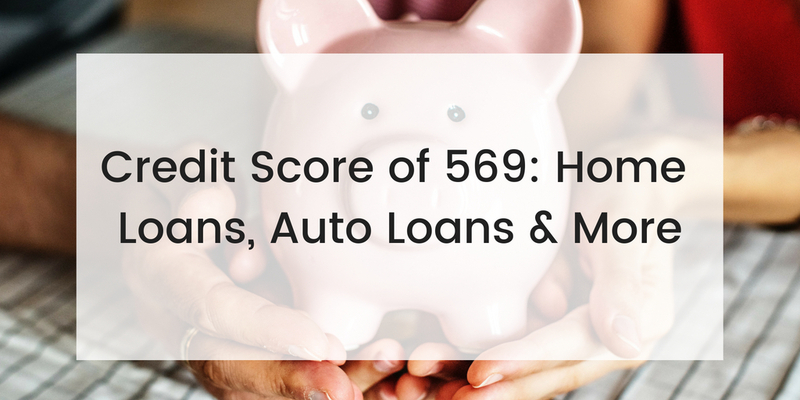 Try to shop around, especially if you’re desperate for a car and must get an auto loan with a credit score of 569. Make sure to avoid directly applying for too many loans, though, as this can hurt your score even more. No matter what, only apply for a loan you can afford. It’ll keep your bank account and stress-levels at a comfortable level. Mortgages will be especially hard. If you do manage to get one, it may be a less established bank and/or a high interest amount. The principle on a house is higher than credit cards or auto loans. A high interest rate can ruin your financial life. Look into FHA or Federal Housing Administration loans. They may be able to help. They accept low down payments and will sometimes take people with low credit scores. If not, keep saving and building credit! Once you’re in a better place financially, traditional mortgages will be far easier to obtain. Imagine the world of opportunities that will be open to you once your credit is good. Nice car? Check! Picket fence? Check. Live the dream! If you want to be able to apply for loans, it’ll be hard work. That’s what we offer here at GoCleanCredit.com: strategic support. Our credit restoration experts can help you back on to your feet in no time. ← What is a Good Credit Score to Buy a House?